Uncontrolled local administrators groups within any organisation pose a huge security risk. Because these groups are locally managed it becomes difficult to audit and maintain them. to standardize settings within a policy. This leads to over permissions because these individual permissions are painful to define and a higher privileged than required is usually assigned. To make it worse, in a mature environment you first need visibility on current members and chances are that you would need to rely on other parties to rectify or change these because of the initial requirements. 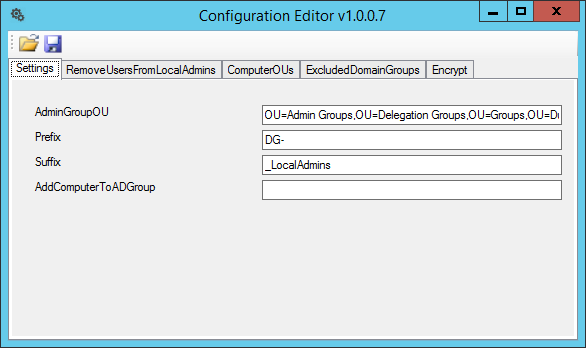 In this article, I explain my approach to centrally manage Local Administrators group from Active Directory using a custom developed application. 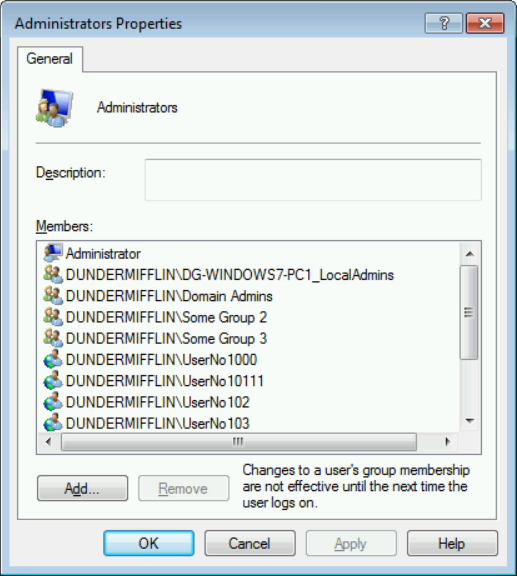 Local Administrators group The local built-in Administrators group found on each computer. 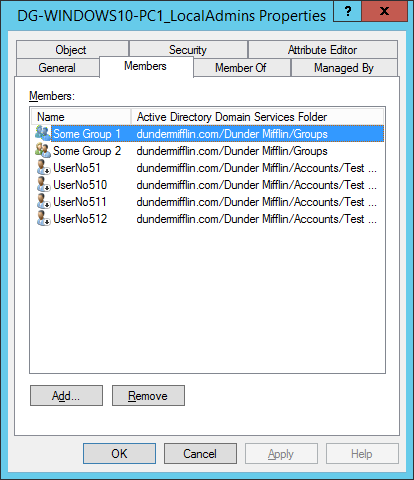 AD Local Admin group An Active Directory group for each computer that is added to the Local Administrators group of the computer. Its purpose is to hold all the members intended to have Administrative permission to a particular computer. Local Administrator Permission Referring to the actual permissions given to Administrators. 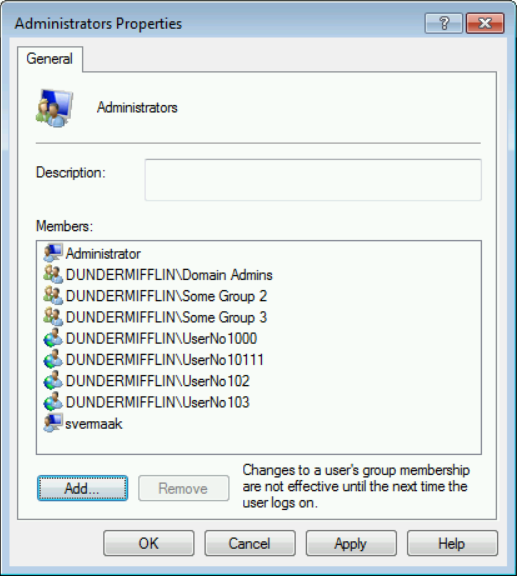 Application enumerates computers in the computer OUs specified and adds them to a collection. Creates a computer AD Local Admin group for each computer if it doesn’t already exist. 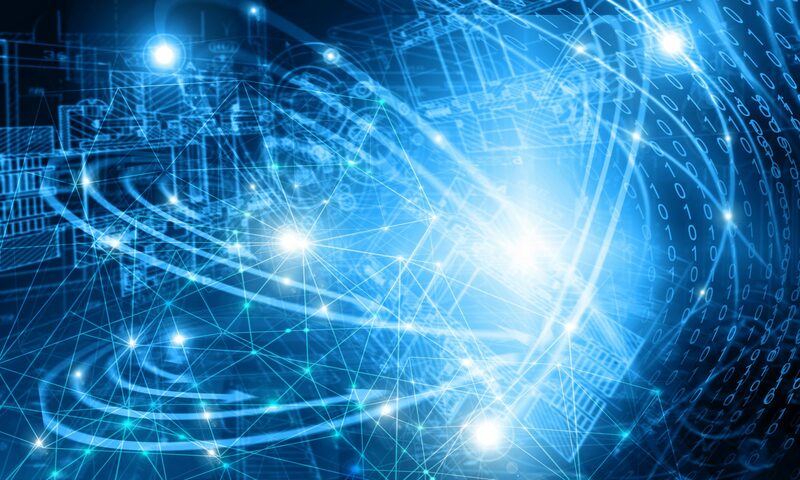 two actions will not occur within same execution to allow Kerberos tokens to update. 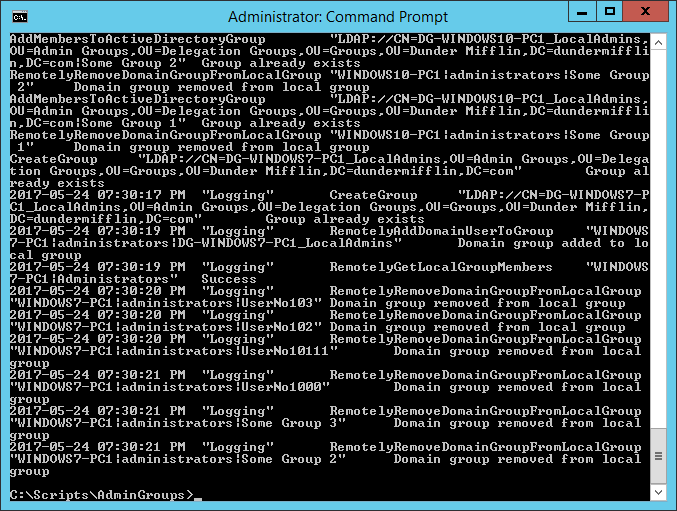 Rebuilding computers with the same computer name will restore all administrators. 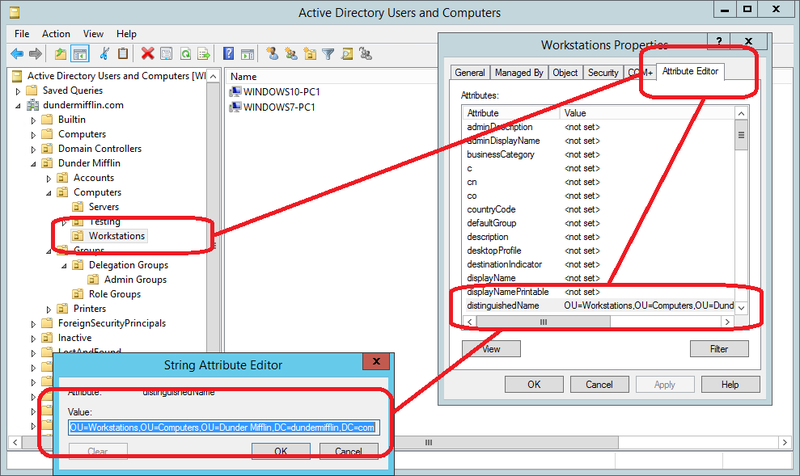 Enable auditing of users with local Administrators permissions without directly querying computer. 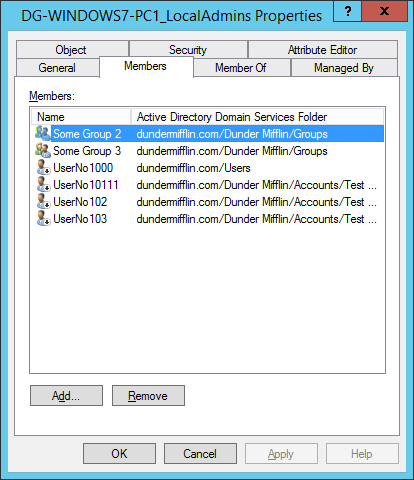 AD Local Admin group members can be queried directly from Active Directory without connecting to remote computers. 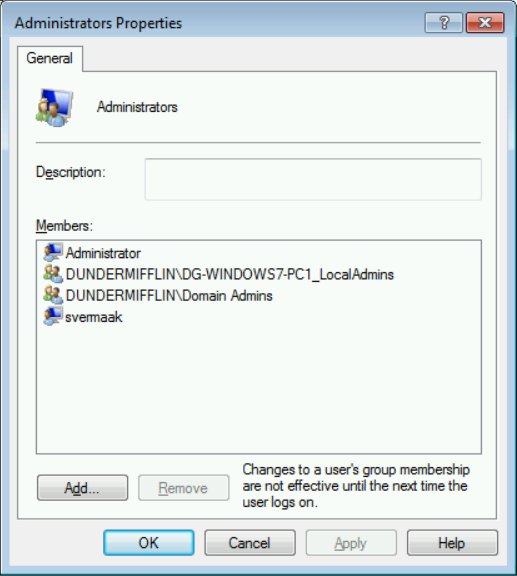 Enforce a stronger password policy for the user accounts with Administrator permission to certain computers. 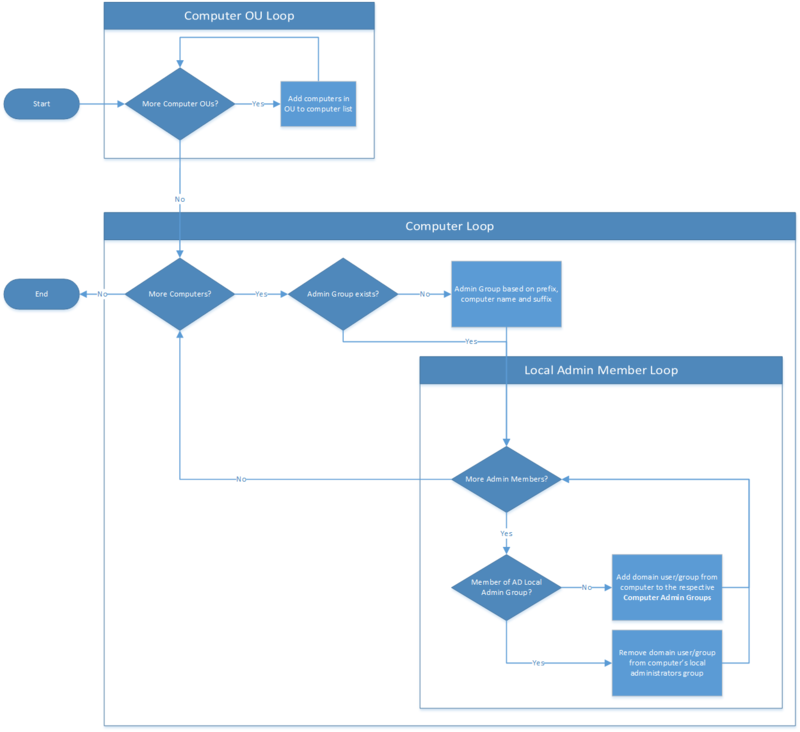 Central management of local administrator permissions. 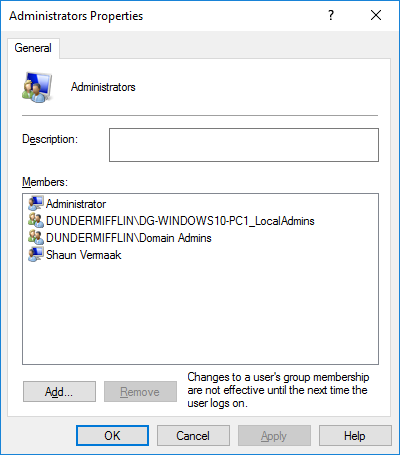 Simply add users or groups (preferably role groups) to the AD Local Admin group to give local Administrator permissions on computers. 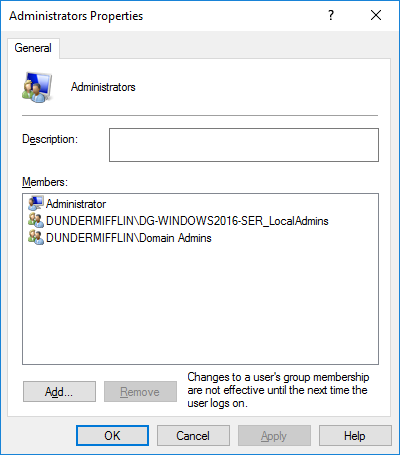 After implementation, local administrator permission can be enforced via AD. to a folder of your choice on the computer on which it will be scheduled to run. 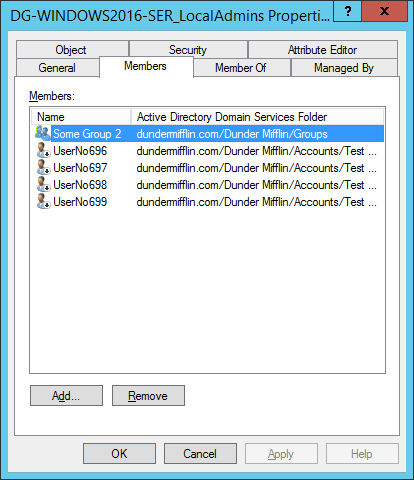 2) Create a location in Active Directory to create AD Local Admin groups in and record the distinguished name (DN). 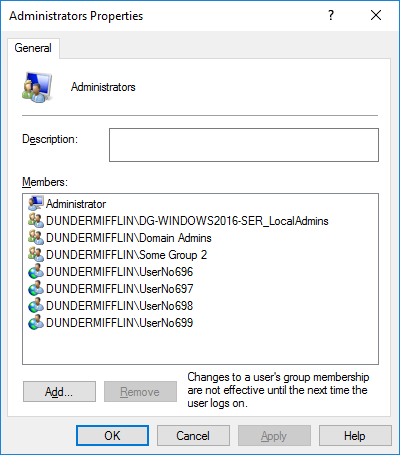 3) Record all the Computer OU’s distinguished name (DN) for the computers that AD Local Admin groups need to be created for. These can be workstations or servers but generally this in only done for servers. 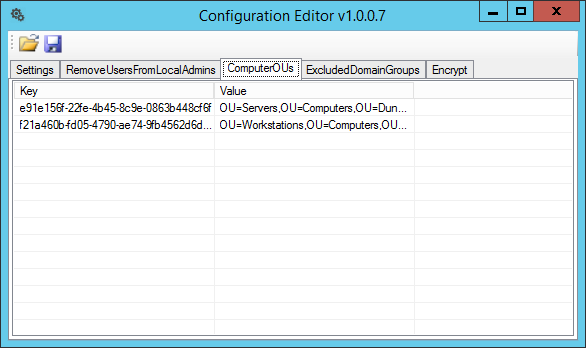 All configuration is stored within the AdminGroups.ConsoleApp.exe.config file and can be either edited directly or with my Configuration Editor tool. 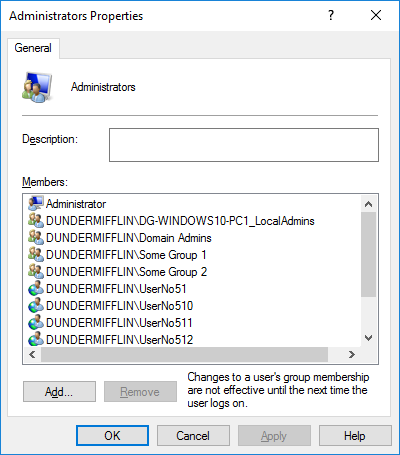 a) On the Settings tab, enter the Admin Group OU’s distinguished name (DN), recorded in Step 2.
b) Enter the prefix that should be used when creating AD Local Admin Group. 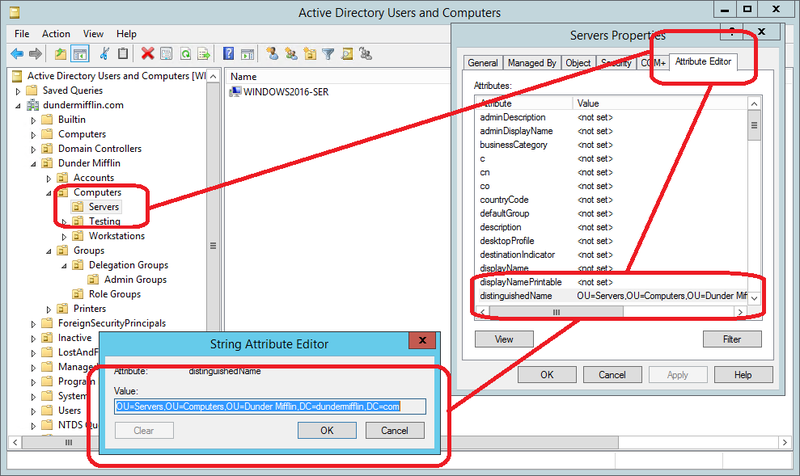 c) Enter the suffix that should be used when creating AD Local Admin Group. 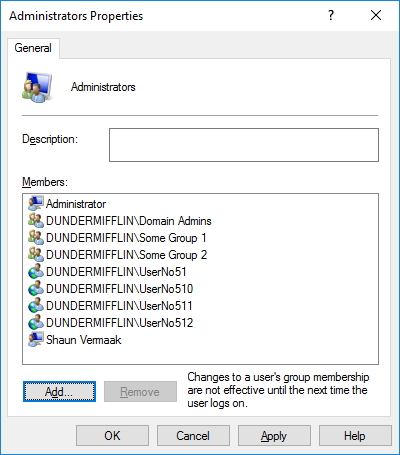 d) Optionally add a Group Name to add the computer account to on execution. 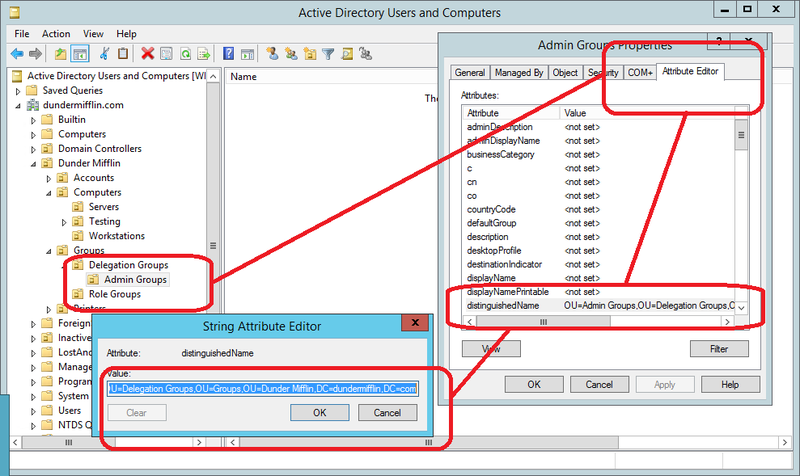 This is useful if you want other policies to trigger or if you want to see process of the AdminGroups tool. e) On the RemoveUsersFromLocalAdmins tab, enter usernames of local accounts that you want to automatically remove from the Local Administrators group. 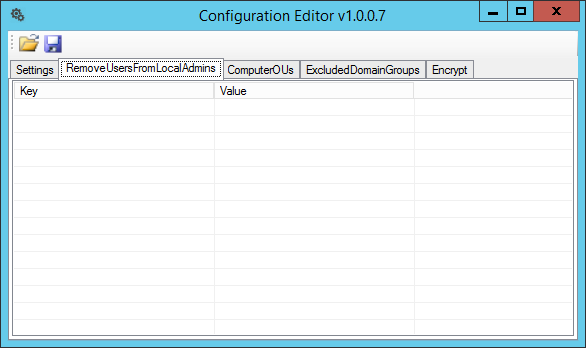 h) Save configuration file and close Configuration Editor. This is how the XML file look for the above setting if you choose to edit it manually. 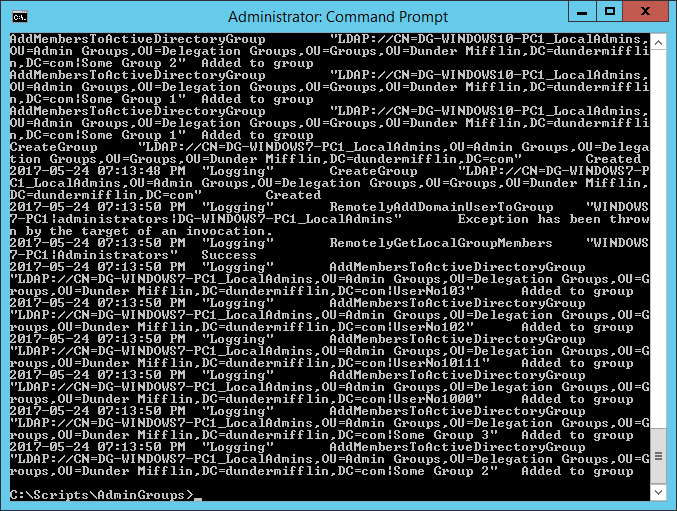 1) Below is screenshots of my three demo computers’ Local Administrators groups pre-execution. 3) Below is screenshots of AdminGroup output and my three demo computers’ Local Administrators groups after second execution. Where did members go? They are now safely within the AD Local Admins groups. 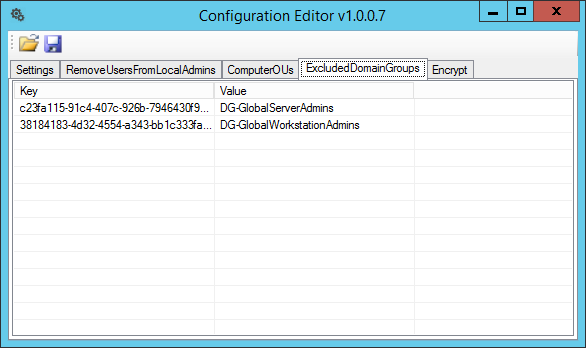 Here is the section in code that manages the AD Local Admin Groups. 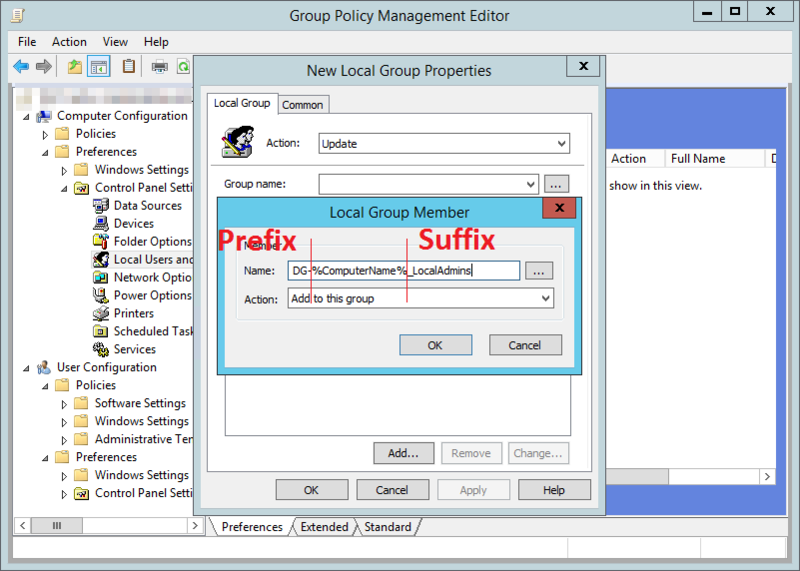 Using this process, or one similar will give better visibility on existing users with Local Administrators permissions and the ability to better manage them.